Margarine is a product based on plant oils and animal fats, water, emulsifiers with the addition of flavors. Margarine, as solid coking fat, is widely used as an ingredient for cooking of many various dishes. 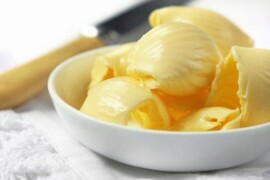 Modern margarine can be produced from various types of plant oils, both refined and additionally hydrogenated; animal fats can be also introduced. In order to ensure high taste qualities of margarine various flavor additives are included in its content: dry milk, whey, salt, sugar, flavors and other food additives. Contains exclusively plant oils having achieved solid thick texture as a result of hydrogenation – thermal processing at temperatures exceeding 200 grades. Margarine for cream is intended for full replacement of butter in creams, soufflé, tender fillings of sponge cake rolls and cakes. The basic distinctive characteristic of these products is the plasticity of the margarine within a wide range of working temperatures, steadily high quality and stability of the basic parameters.